A strong quarter by Lexi Wallen helps ISU earn their 6th conference win (Photo courtesy Anthony Ferretti/WZND). NORMAL – The Illinois State Redbirds earned a crucial win on home court to take a step up in the standings Sunday afternoon in the annual Play-4-Kay game. Redbird Women’s Basketball beat the Indiana State Sycamores 78-70 and increased their win streak to three games and move to fifth in the MVC. It’s a big win for the program not only because of standings, but their shooting percentage is around 70% in the last three games and their defense has stepped up. Kayel Newland opened up the scoring for the Redbirds on their first possession of the game. After the Sycamores tied the game, both teams exchanged baskets and held the game to a tie four times. ISU trailed by three to end the opening quarter and struggled from the field, shooting 39%. The Redbirds got off to a 7-0 scoring run in the second quarter and took over the lead. The half ended with a pair of layups from Paige Saylor off of steals to increase their lead to seven. A quick three by the Sycamores cut the Redbird lead to four, heading into halftime up 36-32. The Redbirds went on another seven point scoring run to open the half and increased their lead to 11. 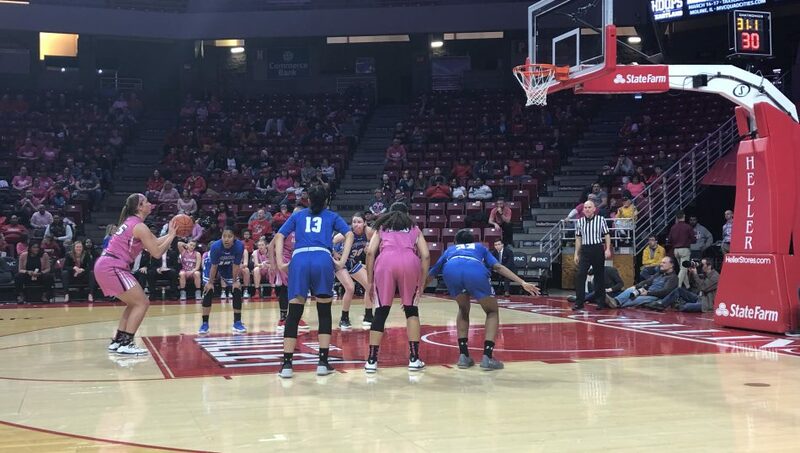 The Sycamores cut the deficit in half multiple times, but the Redbirds responded with a strong defensive effort, holding the Sycamores without a field goal for a period of time. The Redbirds hoped to close things out with a six point lead heading into the final quarter. Indiana State got their first lead of the game in the fourth, but ISU erased the deficit off of points from Tete Maggett, a pair of free throws from Viria Livingston, and 12 points from Lexi Wallen . Wallen finished the game with 16 points, the majority of which came from being aggressive down low against an athletic Sycamore team. Tete Maggett led all Redbird scorers with 26 points and seven rebounds. The Redbirds will look to increase their win streak when they visit the Missouri State Bears Friday night at seven.